Sunday October 7th. I walked up the stairs to Jim Searles’ dream studio. The afternoon sun was streaming through the windows. A man tickled the keys on the grand piano. I looked around the room for someone I knew. No. Just strangers with cameras. I got some food, (Jim throws a party right), and picked a chair. Soon Jim was around with the champagne. A man with a red shirt sat down next to me. One side of the shirt had Al embroidered on it and the other side had Creative with a Mickey Mouse pin above the word. Al is a dreamer too, big time. Turns out Al is Al Emmons, the guy who made the bluebird. The big bird is patterned after a design his granddaughter Katie came up with. Al’s wife Ginny went to the library to research bluebirds to help Katie with the task but Katie had her own vision. A vision that, when turned into wire and stucco, caused quite a stir. With Ginny’s help, Al runs a construction company that does a lot of chimney repairs. Well, if you’re up on the roof, why not put a large sculpture up there while you’re at it? So they have: a wolf, owls, an eagle. It caught on, people liked it. Until the Bluebird. Al owned a home in Greendale. That is where the Bluebird landed. For a year no one complained and then one neighbor got a bee in his bonnet and started a campaign to have the Bluebird fly away. He got some help from a city hall building inspector. Al was dismayed at first, and then became a little stubborn. “I’m not going to take it down.” Soon a divide occurred in quiet Greendale, with pro and anti bluebird factions. Neighbors rallied to support the Bluebird. The city brought action. There would be a fine. Al was taken aback by the vehemence of the argument. Katie was saddened, but then she heard “Big Blue” would be in an annual parade. She liked that. The Bluebird came down but the story did not stop. It had reached across the ocean and BBC radio did a story on the bird – calling Al at 3 am to get some quotes. 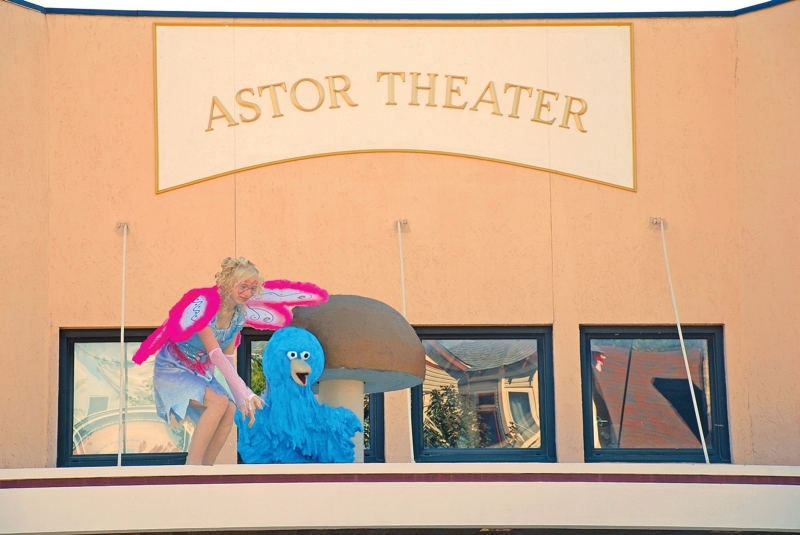 Today, enter big dreamer number two: Jim Searles, who knew Al and had him work on his dream studio above the Brady Street Pharmacy and Astor Street Theatre, “Let’s bring the Bluebird down here and put him on the marquee. Put a mushroom up there too. 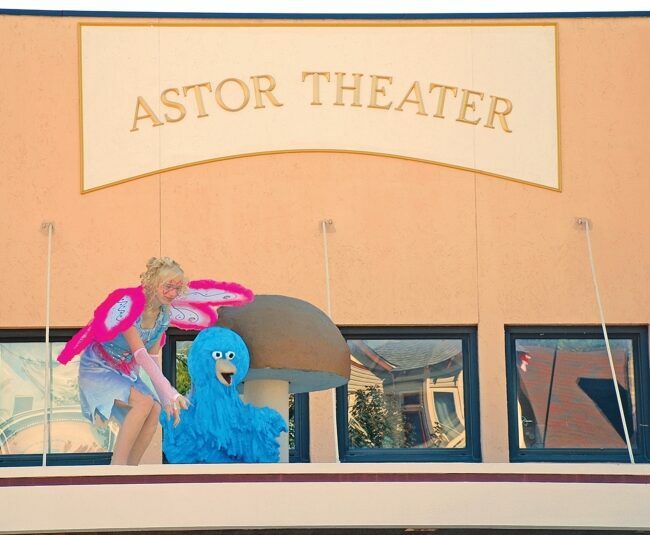 And how about a real live fairy, (costume, Kim’s Custom Shop, fairy, Nikki Huber). Put them all up on the roof and have a photo contest. Fairy dust?….$1,000 first prize.” Jim and company had created another example of urban street performance art on Brady Street. Don’t you just love this city? I can’t post all the pictures but you can see them all. The documentation of the event resides on the windows of the Pharmacy. Jim would be pleased to have you peruse the collection and pick your own favorite. He won’t reveal his, but the judges’ decisions are: 1st Rosalie Jankiewicz, (Rosalie was thrilled, as much if not more by the recognition than by the cash), 2nd Aaron Szyjakowski, 3rd Jennifer Peters, 4th Mitch Lackey, 5th Dale Conklin. Congratulations.